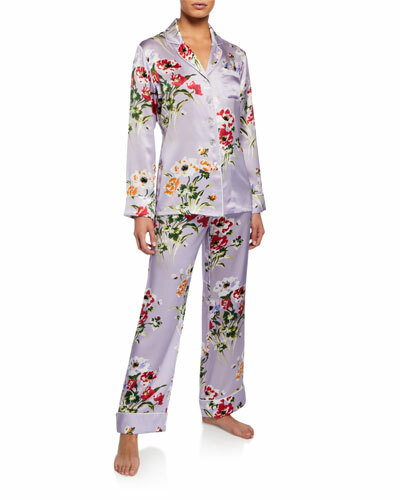 Olivia von Halle established her eponymous line of fine silk pajamas in London in 2011. The designer and trend forecaster was inspired by the loungewear favored by Coco Chanel, as she’d often retire in a luxe pair of pajamas after a long night of festivities. In 2017, Olivia von Halle launched its first ready-to-wear collection, making these items of sheer luxury more accessible. Exotic animal-themed prints, intricate and bright florals, and lush, saturated solid colors make for a collection that suits every mood. 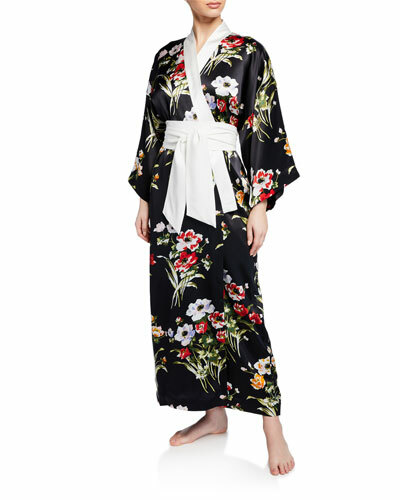 Olivia von Halle creates pajama sets, robes, and nightgowns that have become staples of the jet set lifestyle. 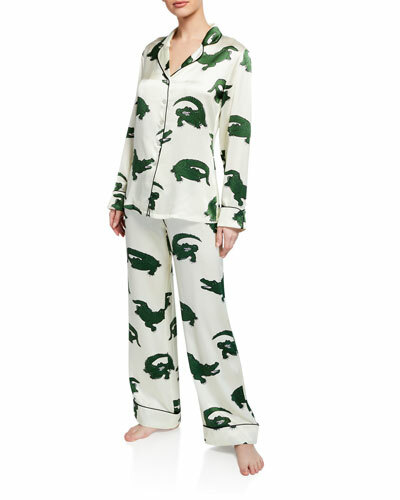 Shop a selection of sleepwear by Olivia von Halle at Bergdorf Goodman. Christine Lingerie "Aphrodite" long nightgown with lace trim. V neckline; square back. Thin, adjustable shoulder straps. Relaxed silhouette. Straight hem. Silk; viscose/nylon/cotton trim. Made in Canada. 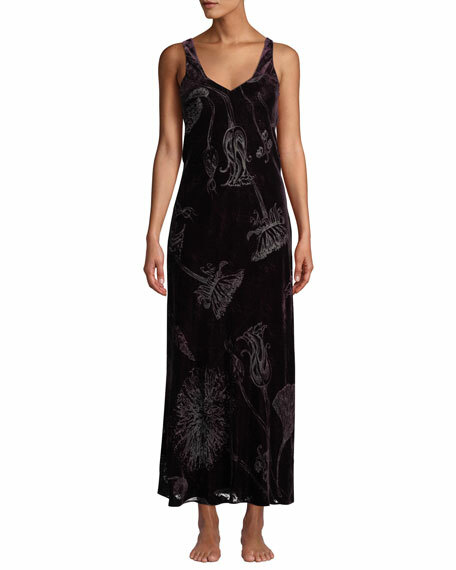 Christine Lingerie "Faberge" nightgown in floral-pattern velvet. Scoop neckline; deep V-back. Thick shoulder straps. Semi-fitted silhouette. Straight hem; side slit. Rayon/silk. Made in Canada. Christine Lingerie "Kaleidoscope" gown in silk charmeuse. V neckline; lace insets. Sleeveless; adjustable spaghetti straps. Bias-cut fit. Mid-calf length. Silk. Made in Canada. Ginia "Fine Finish" pajama set with contrast piping. Notched collar; button front. Long sleeves. Patch pocket at left chest. Relaxed silhouette. Includes matching lounge pants. Silk. Imported.